A key asset of businesses and financial institutions is data: client accounts, financial records, proprietary software and passwords. When equipment storing this information ages out of use, it can be vulnerable to data theft. You need a qualified, professional partner in e-waste handling. That's Protec! With Protec, businesses and financial institutions have a partner experienced in handling electronic waste. We offer verifiable proof of data destruction and environmentally responsible recycling. Modems, routers, Faxes and Battery Backups. Protec specializes in on-site hard drive destruction, a critical component in complying with data privacy laws such as PCI, HIPAA, GLBA and FACTA. More than convenient, our service allows for verification that digital media and confidential information has been securely destroyed.. 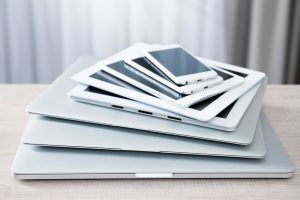 Managing your business or financial institution's electronics through their end-of-life requires a secure process, one that protects sensitive data and ensures compliance with environmental, privacy, and safety regulations. At Protec, we provide: secure logistics and transportation, data security, and remarketing of assents that retain some use or value. Protec is experienced in dismantling or moving larger installations. If your business or financial institution must decommission or move a data center, telecom installation, or computer room, Protec has the experience you need. At Protec, our careful de-installation protocols help prevent damage to facility floors and walls, leaving your space in good shape for its next use. Today, business critical data could be anywhere, from point-of-purchase devices to phones and tablets, as well as traditional PCs and servers. At Protec, we have experience working with a variety of businesses and industries. Whether your world is retail, manufacturing, customer service, or IT, Protec is ready to be your partner in secure, reliable electronics recycling and data destruction. Responsibly recycling your end-of-life electronics through our e-waste IMG_6625-minremoval program allows you to maximize usable space and save valuable time & resources. Protec provides ground level pick-up for basic needs or detailed coordination for more complex operations. We take care of all the heavy lifting, transportation, and any necessary cleanup. Whether you’re making updates to utilize new technology or undergoing a complete office clean-out, our removal services can enable a seamless transition. At Protec, we provide decommissioning, removal, and environmentally friendly recycling for servers, computers, laptops, tablets, and more. Protec is ready to implement a secure electronics recycling and data destruction plan for your banking institution, insurance company, credit union, mortgage loan, or other financial service. Protec strictly adheres to all federal, state, and local guidelines. We work with your financial institution to develop a comprehensive plan, one that meets the needs of your business and provides the compliant, verifiable, and secure e-waste recycling you’ve been looking for. Our on-site hard drive shredding and pickup services make the most demanding jobs quick and easy. We also recycle USPS/battery backups, printers and copiers, toner & ink cartridges, TVs and Fax machines, cable, wires, and more.